Whether you’re a stay-at-home parent or a working professional, everyone can benefit from house cleaning services. The fast pace and hectic nature of life makes it hard to find the time to thoroughly clean your home. Whether it’s dusting, sweeping, vacuuming, mopping floors, changing bed sheets, scrubbing showers, doing laundry, or any of the other hundred items on your list, Maid Brigade’s green cleaning professionals are ready to help. We understand the importance and benefits of a clean home, that’s why we make it our mission to provide a healthier environment for you to enjoy with loved ones. Depending on the level of clean you’re looking for, we have options for everyone and every house. From deep cleans to regular and one-time cleanings, our team can schedule cleanings that make sense for your life. Plus, if you’re currently renting a smaller space, we also offer apartment cleaning services. Why Book a Home Cleaning With Us? Running a household can feel like a full-time job! From after school activities, dinner and weekend plans, it can feel impossible to fit in time to tidy up the house. Plus, when you finally do have a break, who wants to spend it cleaning? Instead, let us, the green cleaning experts, handle all your home cleaning needs. We’ll work with you to design a program that allows for more rounds of tennis, golf, or binge-watching the latest must-see series! 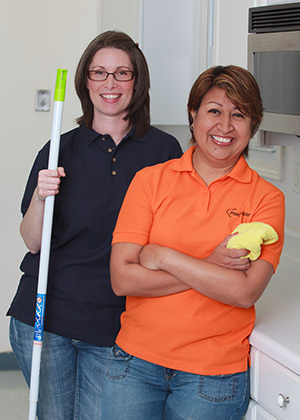 We understand that every home and family is different with a different set of cleaning needs. That’s why we customize each house cleaning to suit the needs of the customer! Curious about cost? It’s easy to get a free quote! Just complete the free estimate form, and expect a call from one of our team members with your house cleaning estimate. If you’re looking to schedule a one-time home cleaning or are looking to set up recurring cleanings, all you need to do is fill out our instant quote form and we’ll give you a call, or you can skip a step and call your local Maid Brigade. Maid Brigade believes in the power of two-way communication and we take pride in knowing all of your expectations beforehand to make sure we exceed them. Before we come to your home, one of our team members will talk with you to identify your home’s cleaning needs. After that we’ll schedule a cleaning appointment. If you have any more questions or concerns about an upcoming cleaning or booking an appointment, check out our house cleaning FAQs for more information!